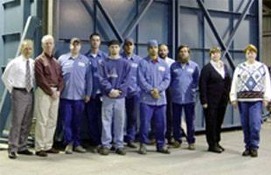 Since 1952, Industrial Combustion Engineers, Inc. ("I.C.E.") has been working hard to develop its well-earned reputation for providing the highest quality industrial heating equipment to users across a broad spectrum of manufacturing industries. Though we are located in the Midwest, we provided services to numerous types of industries throughout the United States and abroad. Our growing client list and our high number of repeat purchasers are testimony to our customers' level of satisfaction with the precision-engineered systems we've developed and produced and with our friendly, personalized service. We are proud to share our client testimonials and to provide you with our client list. Complete operating manual(s) shipped with each unit. Perhaps the best way to sum things up is: "You will receive the highest overall value in industrial process heating equipment (air heaters, ovens and furnaces) available in the market today!" Contact us today and provide us with your specifications, we'll be glad to send you a quotation.